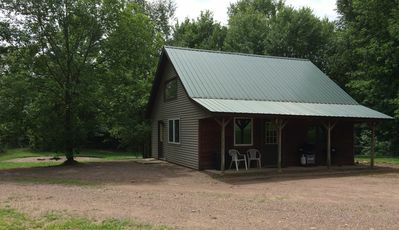 Newly constructed in 2016 by Amish craftsmen this wilderness retreat boasts amenities that are rarely found in the typical Northwoods vacation rental property. Checkout our website at www.brantwoodlodge.com for a complete listing of all our services if you wish to go beyond just a vacation rental house. The Brantwood Lodge grounds contain 160 acres of land with over three miles of maintained roads. There is a creek running through the property that flows into and out of a beautiful pond. The property has been specially managed for wildlife habitat improvement so you will routinely see many species of birds, deer, bear, and furbearers during your stay. Through grants offered by the Audubon Society and the young forest initiative a quality habitat has been established for birds. Positioned within the trails are six stations with food plots for the wildlife viewing. These comfortable enclosures allows close encounters without disturbing the environment so the birds and animals are relaxed and you are able to take stunning wildlife photography. During the summer months we have to use over 1 gallon of hummingbird nectar solution per day due to the high volume of hummingbirds that live on the property. We are conveniently located on County D which is well maintained for easy access to the lodge. Upon arrival you will immediately notice the peace and quiet surrounding the lodge because we are surrounded by over 1 million acres of unspoiled land that has not been developed and never will as it is owned by the county, state , and federal governments. In 2013 Amish craftsman restored the original homestead dairy barn. We were so impressed with their work that we asked them to build a modern amish barn. We designed our new amish barn with the needs of the handicap and wheel chair bound guests in mind so that everyone could enjoy our facility. We have a handicap accessible bathroom, shower and three bedrooms on the first floor. The lodge overlooks a 20 acre field planted with a crop mixture that attracts various types of birds and animals. 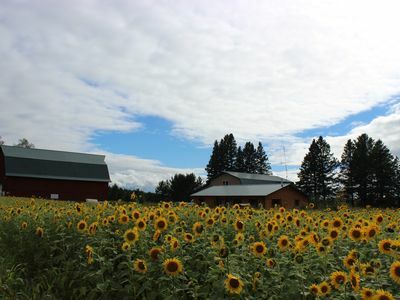 Sunflowers are added to the mixture which provides a spectacular scene during August and early September. This is the ideal time for holding your wedding as there is a location in the middle of the field for your ceremony. Check out our website www.brantwoodlodge.com to see the many other "Experiences" that the Lodge has to offer. During the Ruffed Grouse Hunting Season we book by room at $250/night. We have set aside a few dates for our "All-Inclusive" packages with our gourmet meal plan at $500/person per night.